The Left seized on a comment made by a Trump-backed candidate for the governor race in Florida to damage his reputation. This week, Florida Republican Representative Ron DeSantis won the gubernatorial primary and commented about his win on Fox News. During the interview, DeSantis used the phrase “monkey it up” and the Left jumped on the opportunity to claim he was speaking about his Democrat political opponent who happens to be black. “We do not condone this language and wanted to make our viewers aware that he has since clarified his statement,” Smith said afterwards. Media outlets doubled down on DeSantis’ comments as racist. The Hill Tweeted and put words in DeSantis’ mouth. DeSantis: "The last thing we need to do is to monkey this up by trying to embrace a socialist agenda with huge tax increases and bankrupting the state. That is not gonna work. That’s not gonna be good for Florida." 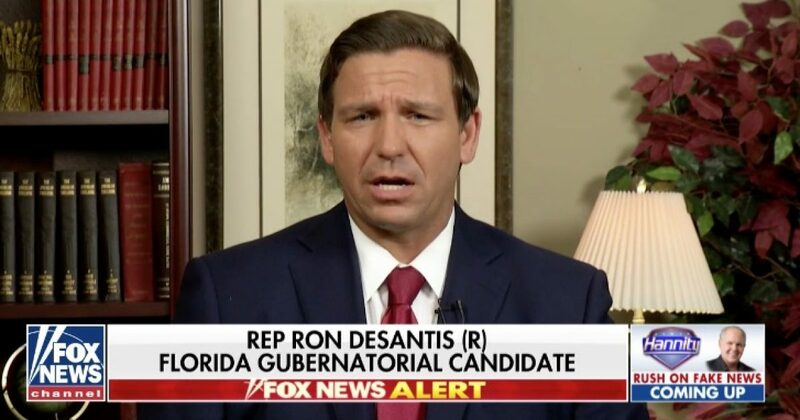 DeSantis appeared on Fox News’ “Hannity” to clarify his comment (watch video). This phrase is nothing new and has nothing to do about racism. To DeSantis’ point about failed socialist policies, Gillum, if elected governor, wants to increase Florida’s corporate tax by more than 40 percent. That’s a 40.9% increase — a tax hike of over a billion dollars. Gillum’s tax hike to 7.75% will give Florida the highest corporate tax rate in the region — higher than Georgia, South Carolina, North Carolina, Tennessee, Alabama, and Mississippi. There is a double-standard when it comes to what Republicans say versus Democrats. Then-Senator Obama said similar words while addressing a crowd during the 2008 presidential campaign. Where was the outrage over Obama’s comments? Liberals will seize upon anything to play the race card when it fits their agenda.